The Federal Government's Sessional Papers for 1906 records an expenditure of $260.00 for a lighthouse keeper, one Jno. (sic) Corbett, at Port Williams; an entry in the Papers for the same year indicates that under Wharf Work, a sum of money was authorized for repairs to the pier at Port Lorne. It appears that these expenditures are in no way connected but when you finish this column you will see that they are. But let's start with an earlier Sessional Paper, one dated 1883. Two years ago when Leon Barron was scanning this Paper for Kings County items he came across reference to payment of a salary to a lighthouse keeper ( a man named Graves) at Port Williams. This entry was puzzling because to the best of Leon's knowledge there had never been a lighthouse at or near Port Williams. Since he is an avid marine history buff, Leon was fairly certain of this. But to be sure he searched for other references to the Port Williams lighthouse. While Leon found no mention of a lighthouse at the Port in local history books he continued his search. A number of older Kings County residents were quizzed but none remembered a lighthouse; most were skeptical that one had ever existed. Then in the Sessional Papers for 1871 Leon found a payment of $253.00 to one James Dunn for his services as lighthouse keeper at Port Williams. He was now partly convinced that the lighthouse had existed and he continued to look for more evidence. By chance he happened to mention his search to another marine history buff, Reg. Clarke of Walton. 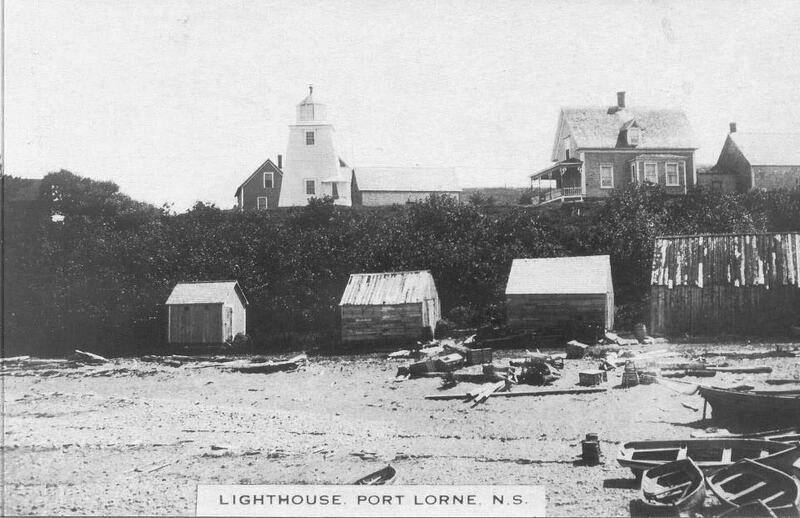 Mr. Clarke told Leon that the Port Williams lighthouse not only existed, he could provide a photograph of it from his collection. Numerous references to the Port Williams lighthouse in Federal records and a photograph: This was enough evidence to suggest that the lighthouse existed even though no one could recall it and it was apparently ignored by historians. Eaton's Kings County history mentions only one lighthouse, for example, and this was at Horton Bluff. The history of Port Williams ("The Port Remembers") notes that the Cornwallis River channel was hazardous but there is no mention that a lighthouse was a necessity nor is there any inference that one was required. Leon Barron had his photograph and the Sessional Paper references but he was still mystified by a lack of local knowledge of the lighthouse. He continued to ask around but was met with blank looks and chuckles. Then with the photograph in hand, he tried to pinpoint the exact location of the lighthouse which appeared to have been on a rise, possibly where a plant and warehouses are located today. The task proved impossible; there had been too many changes in the village of Port Williams over the years. Two years went by and the location of the Port Williams lighthouse was still a mystery. And despite apparently concrete evidence that it once existed, Leon was still doubtful. Too many people were telling him otherwise. Last December Leon Barron was again going though the onerous task of reading the Sessional Papers. The Papers number in the thousands and for the most part they are dull, dry, boring and difficult to read. After several hours of thumbing through the Papers Leon was half asleep and he almost missed the item that explained the references to the Port Williams lighthouse. The Paper was dated 1883 and under "Pier Work" was this enlightening entry: "Port Lorne, formerly Port Williams or Marshall's Cover." The mystery of the Port Williams lighthouse was solved. Port Lorne has a long history. This page will display posts related to our history. Send in articles, photos and stories for inclusion on the site.